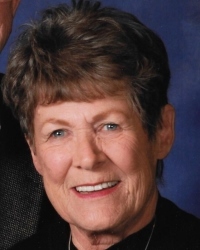 Shirley Schmidt passed away at her home in Whitefish, Montana on March 21, 2019. She was born in Kalispell, Montana on July 2, 1938 to John and Jennie Paola. She graduated from Flathead High School and attended college at Bozeman, Montana until her then-husband’s career took them to live in the Philippines where they raised their three children, Cindy, Jerry and Bryon Granmo. Upon returning to Montana, Shirley worked as a realtor in Whitefish for over 25 years. In 1981, she married the love of her life, Mark Schmidt. They developed and ran Forest Acres Mobile Home Park in Whitefish, while Shirley continued to work in real estate and Mark built custom homes. Together they enjoyed a full and exciting life – exploring the Bob Marshall Wilderness on horseback; showing and competing their mules and horses all across the country; traveling the world, from Argentina to Zimbabwe and all points in between. Shirley walked on the Great Wall of China, climbed Macchu Picchu, boated the Amazon, and dipped her feet in the Ganges River. She experienced great loss in her life as well, having to bury her two sons before her – Jerry in 1982 at age 22, and Bryon in 2004 at age 40. She missed her boys every day, but we rejoice that she is with them now in the arms of her Heavenly Father. Shirley loved people, and her warmth, generous spirit, and loving nature attracted people to her. She gave so much of herself to others, whether it was entertaining friends and family, sharing seeds and plants from her well-loved, glorious garden, or volunteering for one of her favorite charities. Shirley had a joie de vivre that was contagious and a smile that would light up a room. She will be missed by everyone who was fortunate enough to know her. Shirley is survived her beloved husband, Mark, at the family home; her daughter, Cindy, of Whitefish, Montana, and her granddaughter, Marit, of San Diego, California. Funeral services will be held at Christ Lutheran Church, Whitefish, Montana at 11:00 a.m. on Thursday, March 28th. The family requests that in lieu of flowers, a donation be made in Shirley’s name to Child Bridge, PO Box 310, Bigfork, MT 59911.